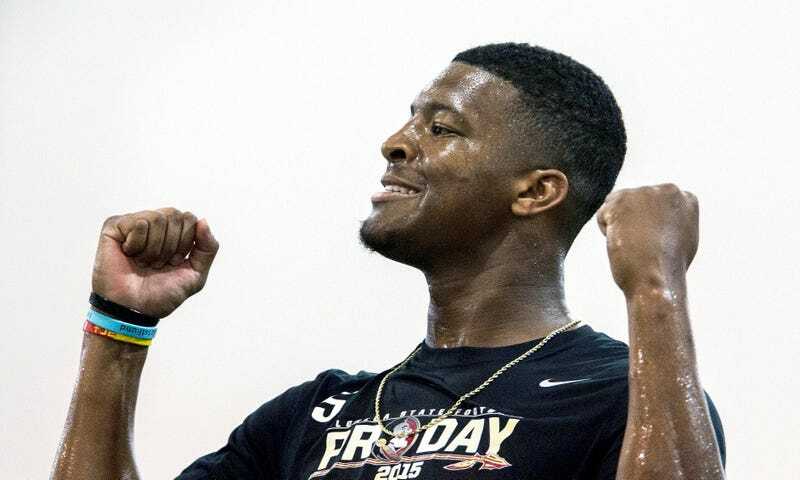 NFL Exec: Drafting Jameis Winston Will Be "A Horrible Mistake"
Bob McGinn of the Milwaukee Journal Sentinel surveyed 19 scouts on the NFL prospects of the draft’s top quarterbacks, and they like Marcus Mariota’s chances to succeed a little better than they like Jameis Winston’s. They peg Winston as being about as likely to wash out as to become a competent NFL quarterback, and a handful of the scouts believe Winston has the potential to become an all-time bust. “I see the body. I see the lack of focus. I see the same coach and system. Only Winston’s not as good an athlete and his arm isn’t as strong as JaMarcus’. “Is this guy really going to be the first pick of the draft? You’d be drafting a quarterback that can’t run, has off-field problems, has no power in his legs and makes bad decisions on the field. The history of the NFL teaches us that no one knows anything, and the history of pre-draft chatter shows that nothing anyone says should ever be believed. Still, there’s value in this Journal Sentinel poll just because of the number of scouts surveyed, and it indicates just how torn they are on both Winston and Mariota. All-time great: Mariota one vote, Winston none. At least one Pro Bowl: Mariota eight, Winston six. Average starter: Mariota eight, Winston five. Disappointment: Mariota one, Winston four. Bust: Mariota one, Winston four. We emerge with some anonymous quantification of what everyone’s generally believed all winter: that this isn’t a great draft for QBs, but the top two have enough potential that desperate teams probably can’t afford to pass on them. Inherent in that desperation is the chance that it could be a wasted pick that sets a franchise back a few years. The Buccaneers know they’ll be gambling; they just have to be proficient at gauging their odds.